oatmeal lace design: spring giveaway!!! so we haven't done a blog post in awhile (or a giveaway this entire year!!!) so hooray! we've partnered up with lovely little details to offer up an amazing bridal party gift of 4 (FOUR!!!) custom clutches to one lucky lady. please go check out jacin's blog (I want to get remarried every time I visit and see the phenomenal things she does for her brides) and swoon over all the loveliness while finding out how to enter the giveaway!!! Saw this posted over at LLD, too! Fabulous giveaway...love your very pretty clutches! Pretty nice post. 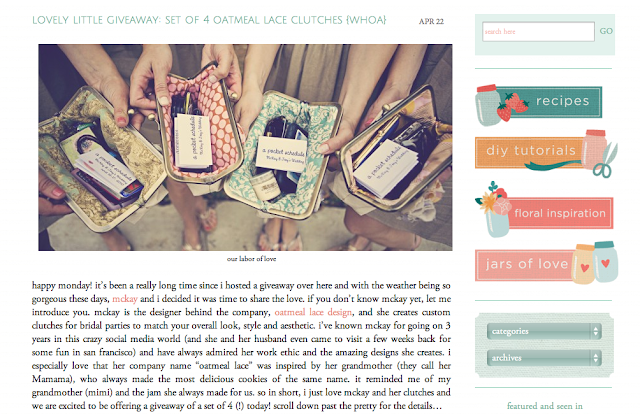 I just stumbled upon your blog and wished to say that I've really loved browsing your weblog posts. In any case I will be subscribing in your feed and I hope you write again very soon!